This is really the improved hibachi grill. 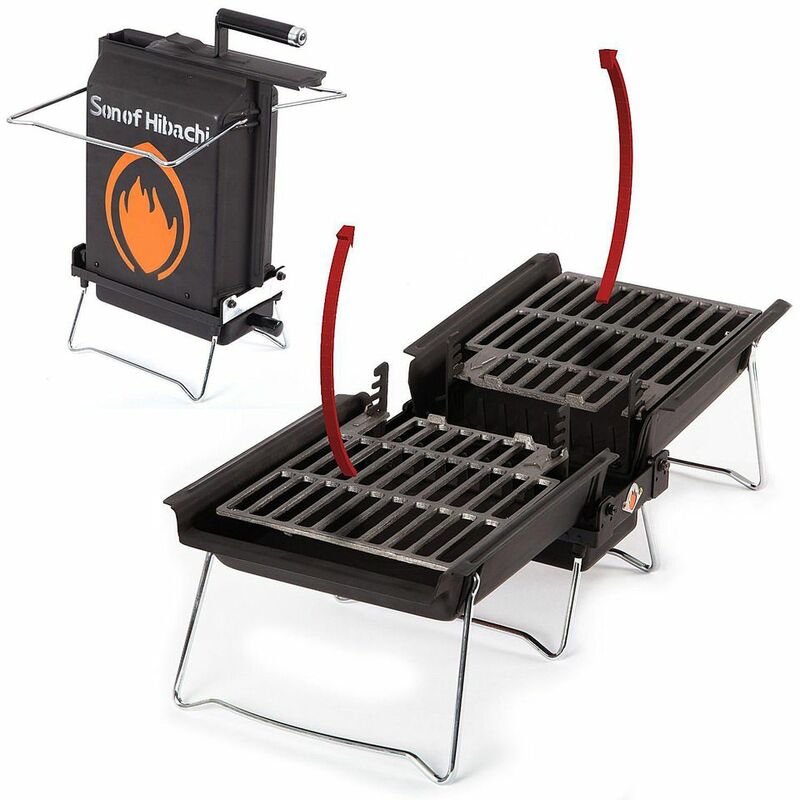 Highly portable and easy to use, there are some really inventive features in this grill and when they work, they work great. Folded up it is a charcoal chimney which gets it hot and ready to grill in less than ten minutes with virtually no fuss. It opens up to 170 square inches of cooking space (larger than a Weber Smokey Joe), and then folds up again (hot) and the ashes drop into the bottom. This is classic, pure grilling without having to deal with the lid. The biggest problem isn't the design or really anything about the grill, but the propensity for it to show up damaged or with other problems. Can be packed away hot with its special snuff pouch. Once upon a time, Hibachi grills lined college dorm balconies and got carted to parks around the world. The problem was that while these cast iron gems were great grills, they were not easy to carry. Enter the Son of Hibachi (which has actually been around for a very long time). Load it up with charcoal and fold it closed. Open the top and light a combustible material in the bottom (like newspaper saturated with lighter fluid) and the charcoal lights quickly because of the chimney-like the design. After about ten minutes, fold it open and set the cooking grates where you need them and start grilling. Once done, fold it back up and put it in the "Snuff Out Pouch" (available with the Combo Kit) and the oxygen is quickly consumed, the fire put out, and the ashes fall into the removable catcher. So the idea is good, the problem with this is and always has been the execution. Many people have complained about broken parts or other damage to the unit. This charcoal grill is clever, but it takes pretty high attention to detail and good manufacturing to make it a great grill. Let's face it; at around $100 USD for the full kit, it is a pricey grill considering you can get a good, but cheap hibachi for around $45 USD. If you are going to get this grill, get the Combo Kit too. Yes, it brings the price to around $100 USD, but the added features are what really makes this portable.